The first proposed tracklist of this mix was equal parts New York art rock and Madchester, but I showed it to my friend Andrew, and he wrinkled his nose. I kinda wasn’t feeling it either, so I ditched all but the first three tracks and started over. My husband said “Why don’t you just make it all New York art rock”, and he was right (although a little Madchester still found its way in). At first glance, some of these aren’t your typical dance songs, yet I’ve danced to all of them. I have distinct recollection of Brian and Michelle playing Nina Hagen and Time Zone on Beat Bash Mk1. Nina references Bowie, who pulled Klaus into his orbit long enough for an appearance on Saturday Night Live. ESG was a New York-based sister act produced by Martin Hannett, and 52nd Street was a Manchester-based sibling act produced by Bernard Sumner after New York opened his eyes and ears to dance music. A Primary Industry does a grinding cover version of New Yorkers Blondie, and Kirsty sings a song about New York that was co-written by Johnny Marr. There’s a lot of cross-influence happening. Time Zone was a collaboration between Bill Laswell, Afrika BamBaataa, and John Lydon, a year before Laswell was tapped to produce Public Image Limited’s masterpiece Album. 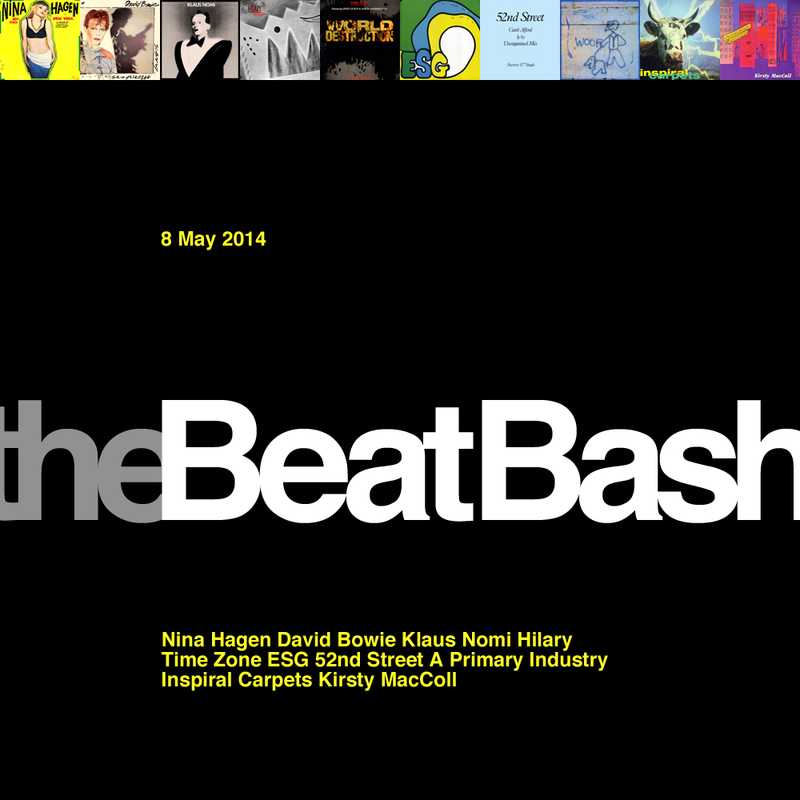 Categories: The Beat Bash | Tags: 52nd Street, A Primary Industry, David Bowie, ESG, HIlary, Inspiral Carpets, Kirsty MacColl, Klaus Nomi, Nina Hagen, Time Zone | By: Jeb.